To setup the server end of the VPN connection, we need to create a new connection, and then check the firewall/router settings. Select Set up an advanced connection and click next to continue. Select Accept incoming connections and click next to continue. Leave the boxes unticked on this next screen and just click next to continue. 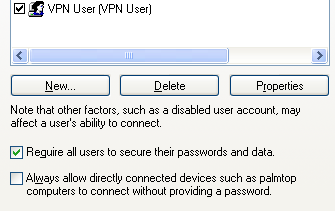 Select Allow virtual private connections and click next to continue. You now need to pick which users are going to be allowed to vpn in. If you created a user earlier, then ensure that just that user is ticked, else pick which user you want to use - remember they need a secure password. Then click next to continue. You can just click next to continue on this Networking Software screen, as you should already have everything you need installed, as you must already have either a modem or network card in the pc. Congratulations, you've now completed the second step in creating a VPN connection. Click Finish to close the wizard. You should now see your new incoming connection in the Network Connections Window.